I’ve spent a lot of time lately cooking outside on the grill while I wait for my new oven to arrive. Fortunately, I benefit from my college-age son’s vast experience at this. He has taught me that if you are really doing it right, barbecue can be the centerpiece activity for your family or your guests Don’t just cook outside, party outside! Take your time. Don’t try to do 5 other things. You wait until the coals are really ready. You gather your people in comfortable chairs by the grill so they can enjoy the smells and watch the lusciousness emerge. Everybody loves to help, even if it is just to offer advice! To really pull people into the scene, I love to do individual pizzas, where everyone assembles their own from an assortment of ingredients. 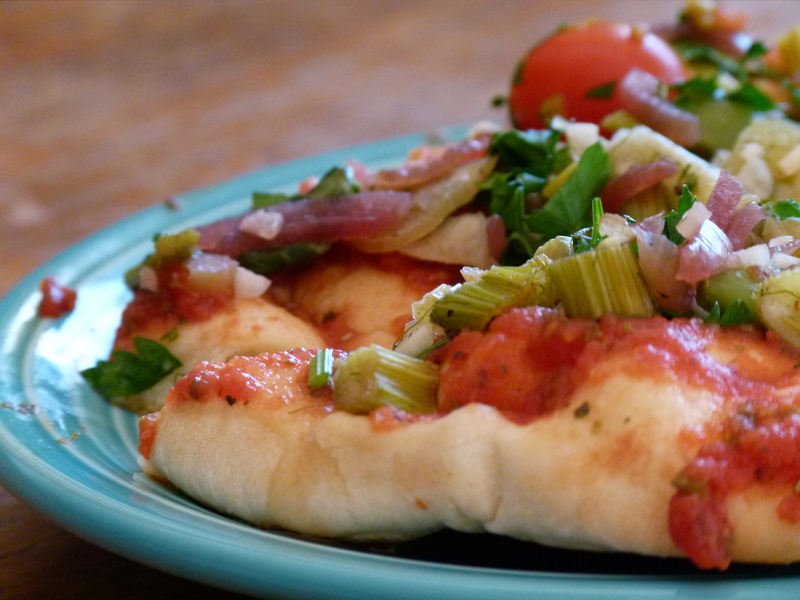 For an easy crust, I use Basson Pita Bread. It stands up to the coals well without charring, and crisps up perfectly after 20 minutes on a low grill. You can use any sauce you like, but I like a raw sauce where the flavors are bright and stand up to the smokey grilled flavor of the crust. I also enjoy using a good no-oil barbecue sauce. 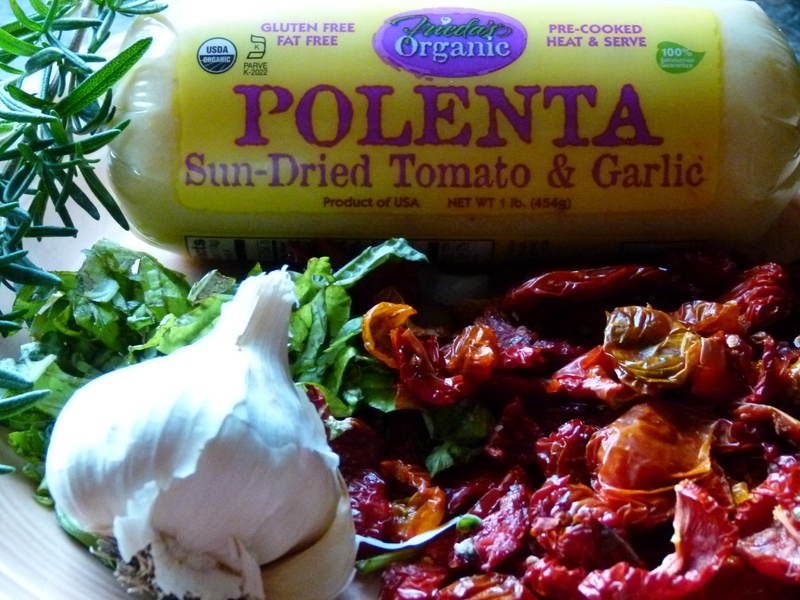 Spoon your finished sauce onto the pitas, lay out your array of ingredients and let your eaters make their masterpieces. Grill for about 20 minutes on low heat, covered, checking often to be sure your coals are not too hot for the bread. Use the indirect method of grilling if possible, discussed here at BBQ University. With this pita bread and the correct low heat, you will not need to oil the grill, making this an Esselstyn diet success. My sister has embraced some serious no-fat vegan cooking. She is a creative gal who has a long history of cooking for a house full of hungry boys, so she will often adapt a meat-oriented recipe. 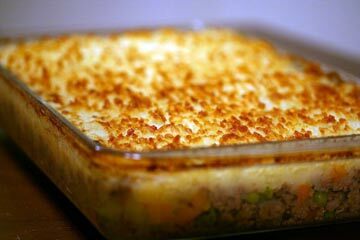 Her new version Shepherd’s Pie -adapted from the website Simply Recipes, really works to satisfy that craving for ground round beef! She is using a vegetarian ground beef product called Smart Ground, which I buy at Fred Meyer, Whole Foods, or Central Market. Prep time: 10 minutes…It takes more time than that! 2. “Sauté” onions and carrots over medium heat in vegetable broth in a non-stick pan until tender. Mix in corn and peas. 3. Add SMART GROUND in chunks and sauté until browning a bit. Add salt, pepper, worcestershire sauce and a cup of vegetable broth and cook, uncovered, over low heat for 10 minutes, adding more broth as necessary to keep moist. Whisk in a tablespoon or so of flour or WONDRA to thicken the gravy. 4. Mash potatoes in bowl with a bit of broth, salt, pepper and your favorite non dairy milk until they are the consistency you like. Season to taste. 5. Put the SMART GROUND veggie mixture into 9 x 13 glass baking dish. Distribute mashed potatoes on top. Rough up with a fork so that there are peaks that will brown nicely. You can use the fork to make some designs in the potatoes as well. Barbecue season is upon us! Somehow, I ended up with 4 grills on my deck for the summer, so I’m hunting down no-fat ideas for grilling and smoking my grains and veggies to succulence. 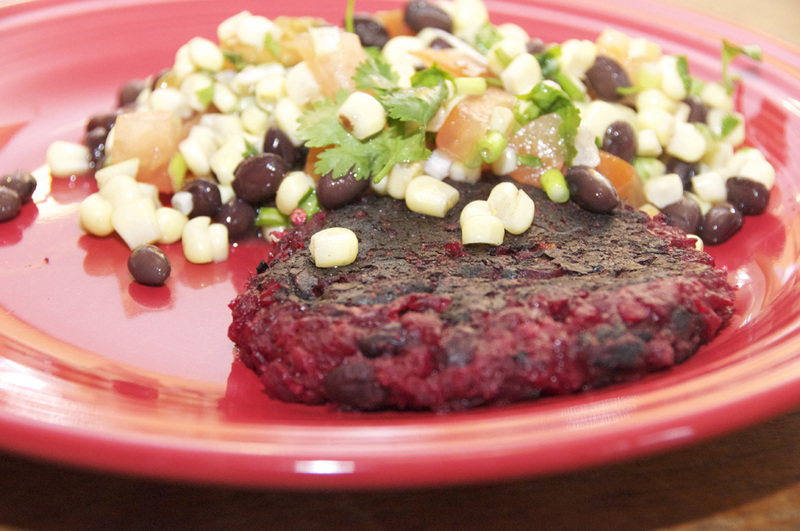 Today, I’ll share my adaptation on a famous vegan dish- the Northstar Beet and Black Bean Burger.This recipe is widely circulated online, but for a no-fat vegan, it required a few modifications. I love the sweetness of the recipe, so my changes are mostly directed toward building a burger that holds together properly for cooking with no oil. I do recommend using whole spices and grinding them fresh- it makes SUCH a difference in the flavor, but you can substitute pre-ground spices, of course! This is kind of a messy project (do you like red fingers?) but when you are finished, you will have a large freezer bag full of handy burgers to cook at your convenience! You will need a food processor and an oven safe non-stick pan for this project. Check out my favorite: the Woll Nowo pan. 1. Cook your brown rice using your favorite method and add it to a large mixing bowl. 2. Peel and quarter your onion and beets. You want a some texture in the veggies here, so you’re going to process in your food processor until the chop is fairly fine, but not mushy (see picture). Do the beets first and add them to a large fry pan. Repeat the process with your onions. 3. 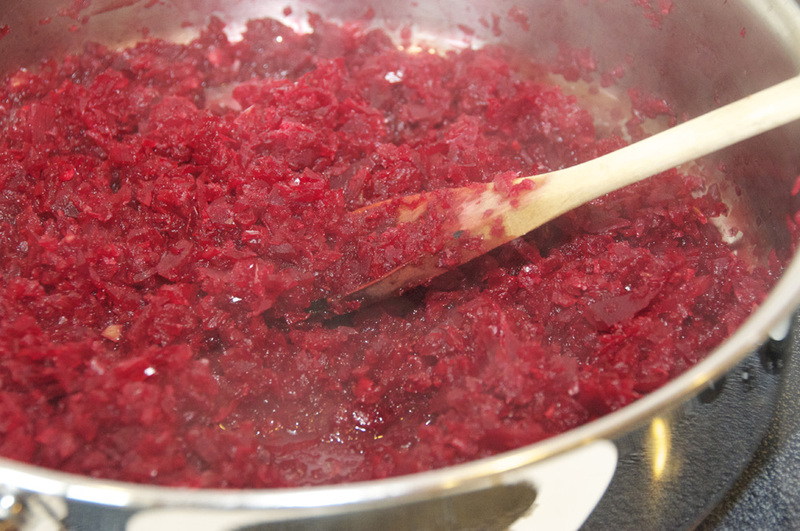 Add 1/2 C of water to the beets & onions and “saute” on medium with a lid until tender – about 10 minutes. Stir every couple of minutes to avoid sticking, and add a little more water as needed. 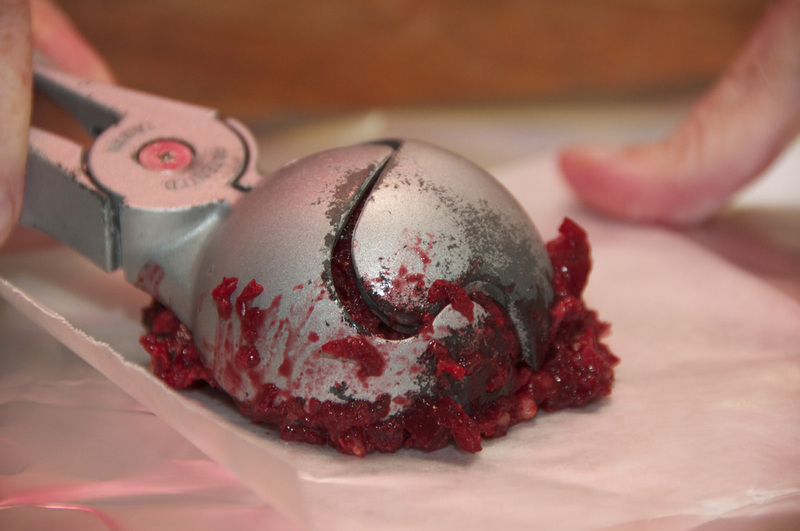 The idea here is to get a nice cooked beet that still has some texture. 4. 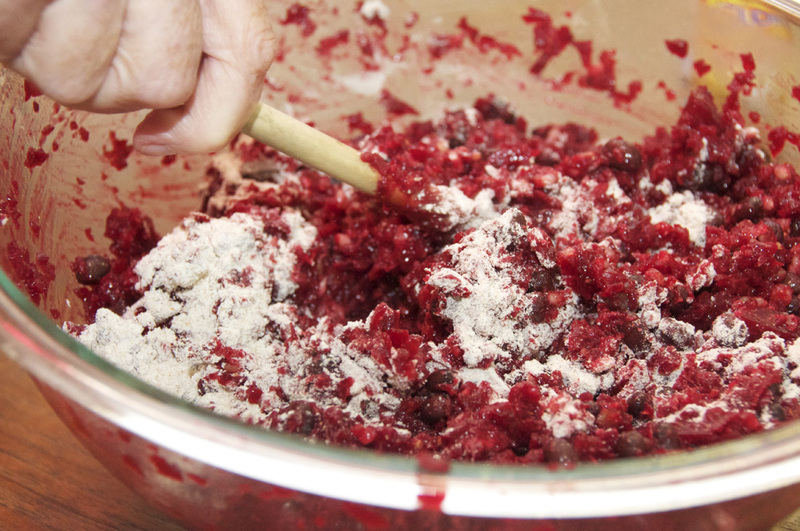 While your beets are simmering, go back to your food processor and add the garlic, raisins, jalapeno (or red pepper flakes), cumin and coriander. Process for about 2 minutes- until the raisins are well ground. Add this mixture to the brown rice. Add the soy sauce, lemon juice, balsamic vinegar, salt, hot sauce, and liquid smoke. Mix together well. 5. 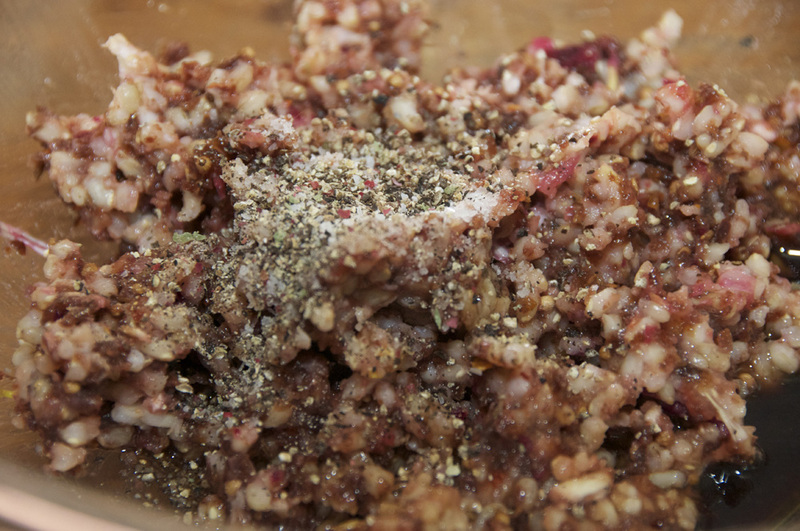 Add your drained black beans and sauteed beets & onions to the rice mixture and stir until completely mixed. Add your flour and mix thoroughly. 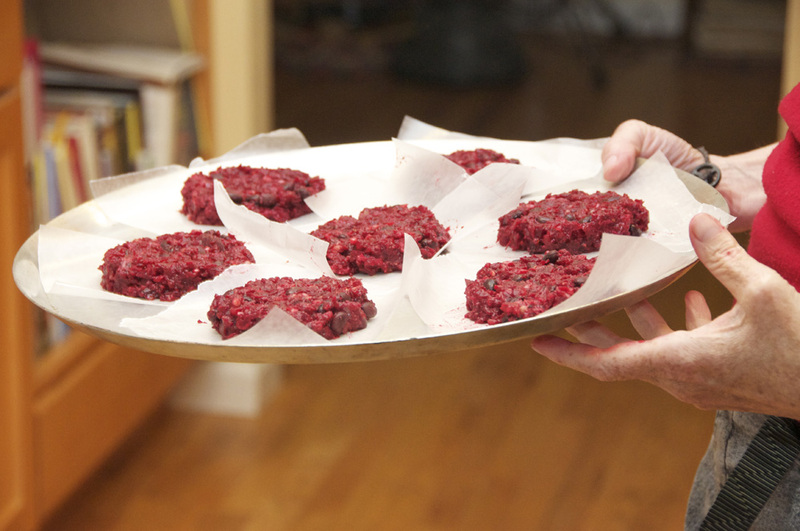 6.To form your burgers, cut wax paper into 5 ” squares. Using an ice-cream scoop, form 18 burgers, one per square. 7. Flatten with a spoon and freeze on a cookie sheet for at least 45 minutes. Store in the freezer in a ziplock bag. 8. Using an oven proof non-stick pan, you can cook these on low heat on your stove top, or use the non-stick frypan on top of your grill over indirect heat to “grill” or smoke the burgers. Barbecue University has excellent tutorial on the indirect method of grilling. Sunshine and warmth have arrived in the Pacific Northwest, and I can hardly wait to fire up the grill. In fact, I did! I wanted to veganize my old recipe for stuffed Poblanos, which I smoke outside on my charcoal chiminea. 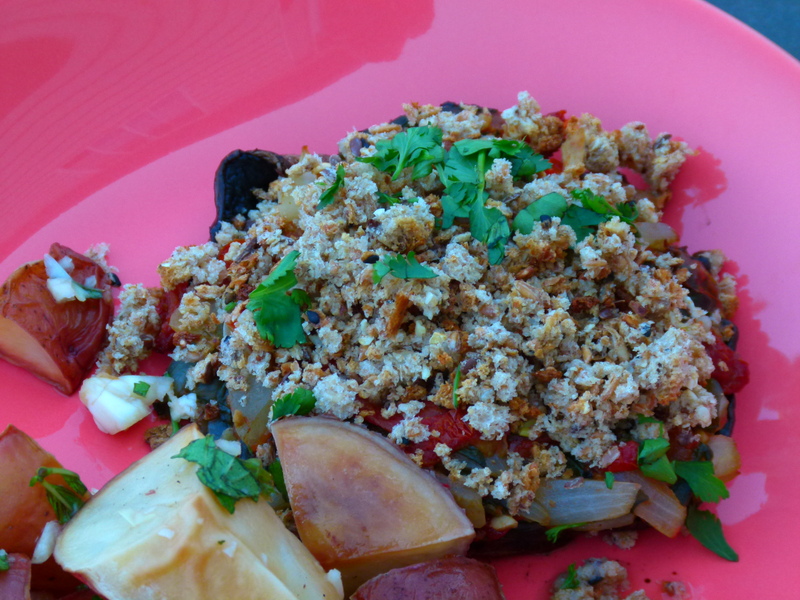 This is a new no-fat stuffing and I honestly prefer it to the old one, which was full of oil and cheese. 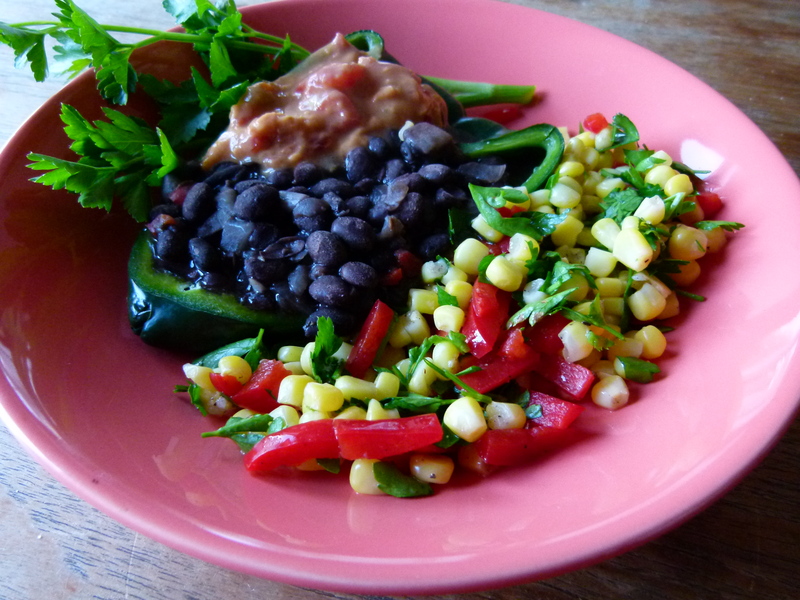 Black beans smoked with maple, garlic and onions, accompanied by a fresh salad of sweet corn, red pepper and cilantro and topped with a great vegan queso – fabulous summery flavors, even in April. Set up your outdoor grill or smoker for indirect grilling and preheat to medium. Soak your wood chips for 30 minutes. If using a gas grill, place the chips in a smoker box and preheat on high until you see smoke, then reduce heat to medium. If using a charcoal grill, preheat to medium, stack the coals around the edges, leaving the center free of heat (where you will set your pan of peppers), and toss the chips onto the coals. Have your stuffed peppers ready! If you aren’t up for the outdoor project, you can also simply put them in your oven, covered, on 350 degrees for about 30-40 minutes. Simmer all ingredients together, uncovered, until liquid has boiled off and beans are thick. Slice 4 Poblano peppers in half lengthwise and remove stems and seeds. Fill each 1/2 pepper with beans and smoke outdoors on a medium grill (I place them in a heavy-duty foil pan) until tender (about 30 minutes) or bake in a 350 degree oven, covered, for 30 minutes. 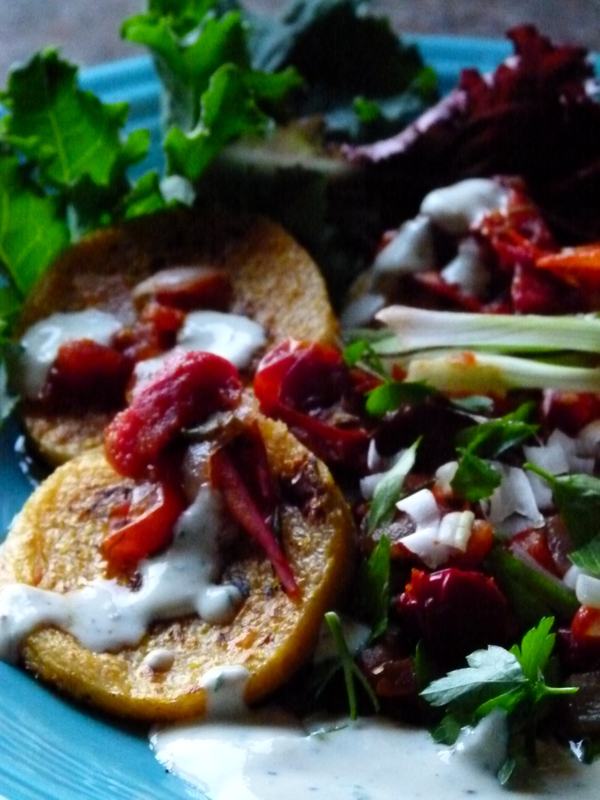 Serve dressed with Corn salad and Nacho Mom’s Ultimate Vegan Queso. It’s gonna be good!